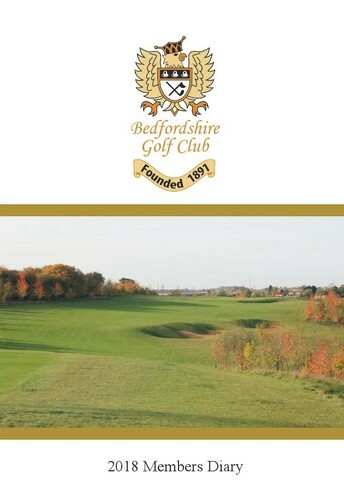 The Bedfordshire Golf Club 2018 Diary has now been published. It contains details of all club competitions and social events scheduled to taking place during the year. The diary also contains a brief history of the club and some background information about many of the more significant club competitions throughout the year, along with formats for each. Monday 16th April sees a new competition in the Senior’s calendar. The President’s Senior Putter. This will be a Yellow Tee Stableford, two-tee start and will be followed by Sandwiches and Chips. The Mixed Match, away at John O’Gaunt is correctly shown on the 26th August, but it is also shown on 29th July which is a duplication. Please therefore delete the July entry for this match. Copies of the diary are now available from both the club office and the bar/lounge. Please pick up your copy the next time you're in the club house. NB: In due course, there will also be a web version on the club website for you to browse.